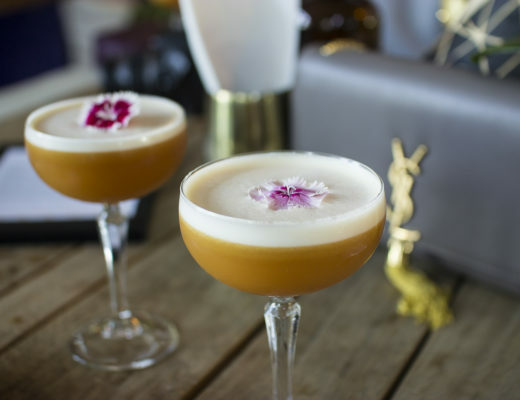 After the success of opening Saint Larry Cafe only a matter of weeks earlier this year, owner John Parker has launched the latest venue in his hospitality group that includes the likes of The Standard and Halford Bar. 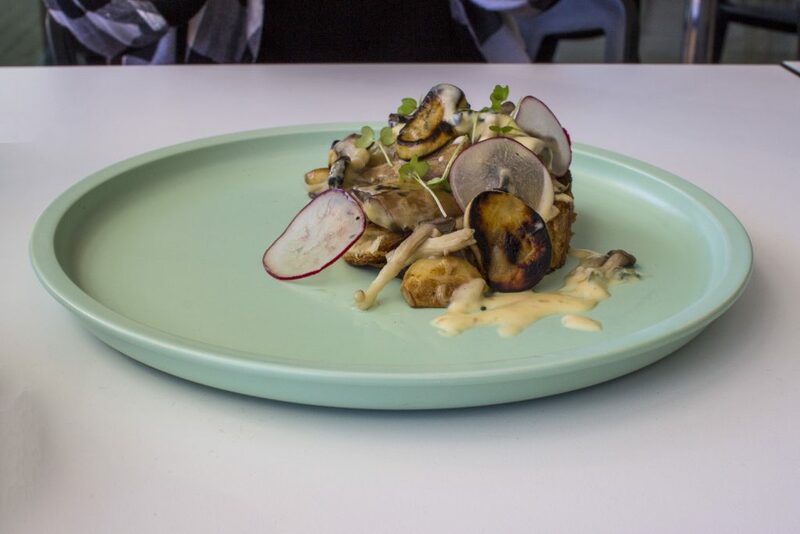 Situated in the Art Gallery of Western Australia, Arthouse is a modern bistro style eatery that will cater to the likes of the public as well as intimate events at the gallery. 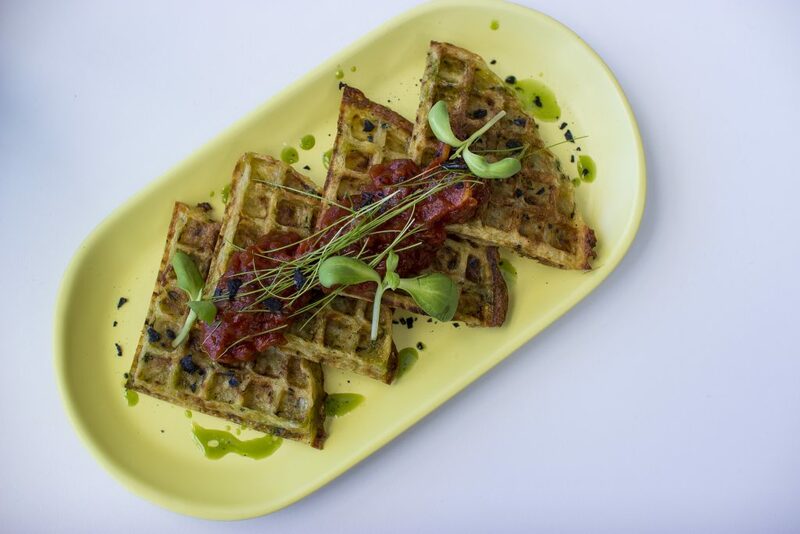 To start things off, they’ve opened with brunch and lunch menus only though rumour is dinner may be included down the track. 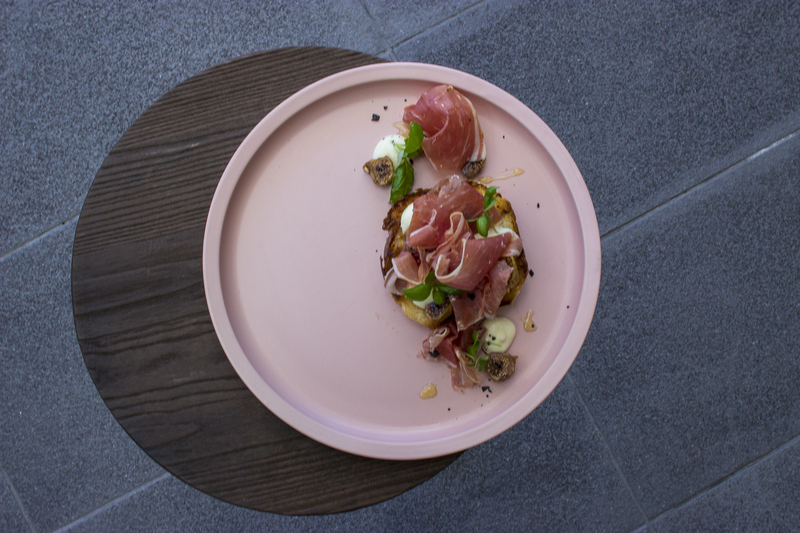 And with the ever-impressive Chef Chase Weber curating the food on offer, it’s a welcome addition to Northbridge. I stopped by for brunch on the opening weekend, with foodie pals Laura, Ai-Ling and Carly from venue neighbour, Chicho Gelato. A good little girl squad to dive in to the dishes and share up a feast between us. With JP present we left the hard work in his hands to order some dishes he thought we might like to try. 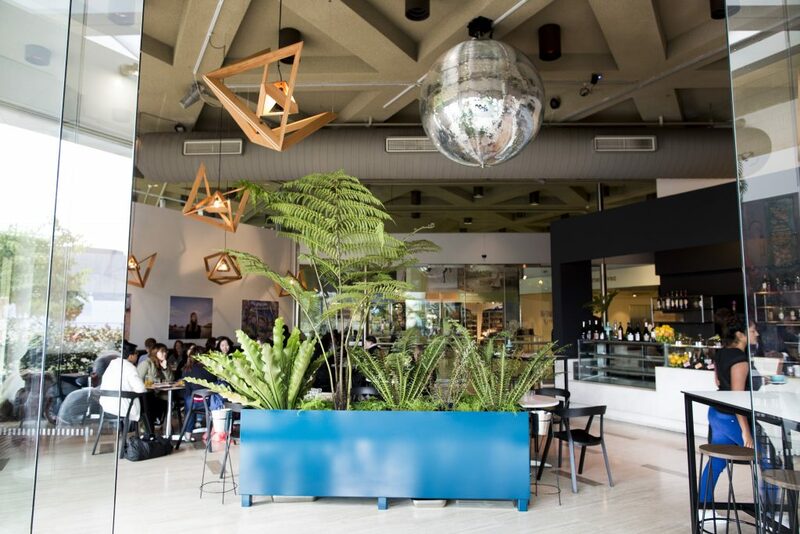 And while we sipped our coffees (peppermint tea for me of course), we took in the impressive decor which features fresh greenery, art handing on the wall and a mammoth mirror ball that is pretty impressive in both size and glory! 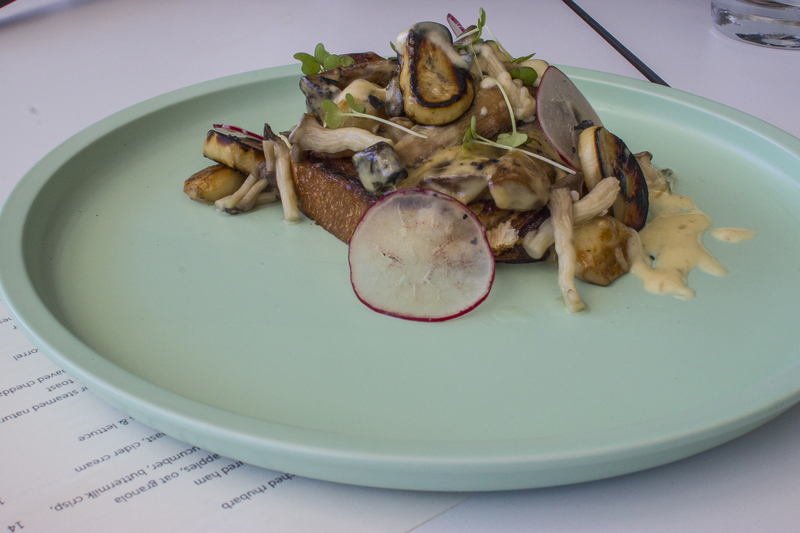 The roast king oyster mushroom with brioche toast and cider cream ($15.00) was our first dish to taste, and also my favourite of them all. The buttery brioche toast was barely visible under the scattering of mushroom. 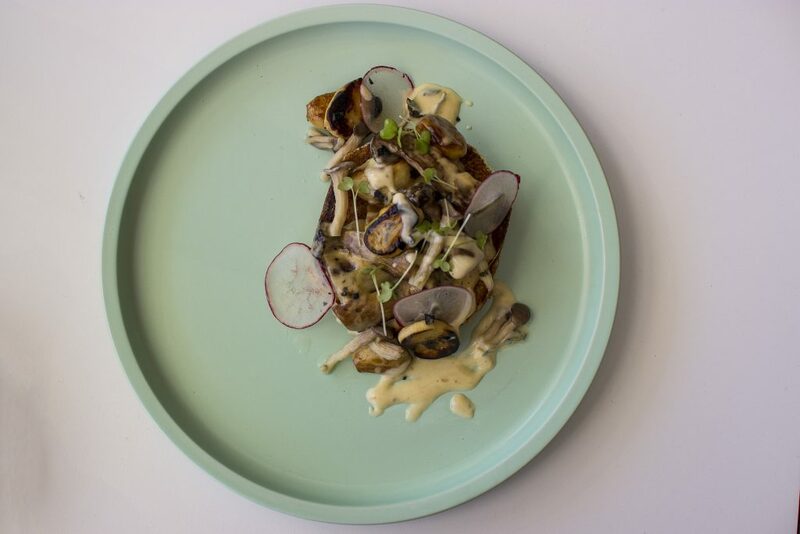 There were other mushrooms beyond the slices of king oyster, most noticeably shimeji. The cider cream was light but flavoursome; definitely a delicious accompaniment that was nice to enjoy. It was also something a little different to your standard brunch sauces like hollandaise. And just a side note – how gorgeous are the Aura by Tracy Ellis plates used with each dish! 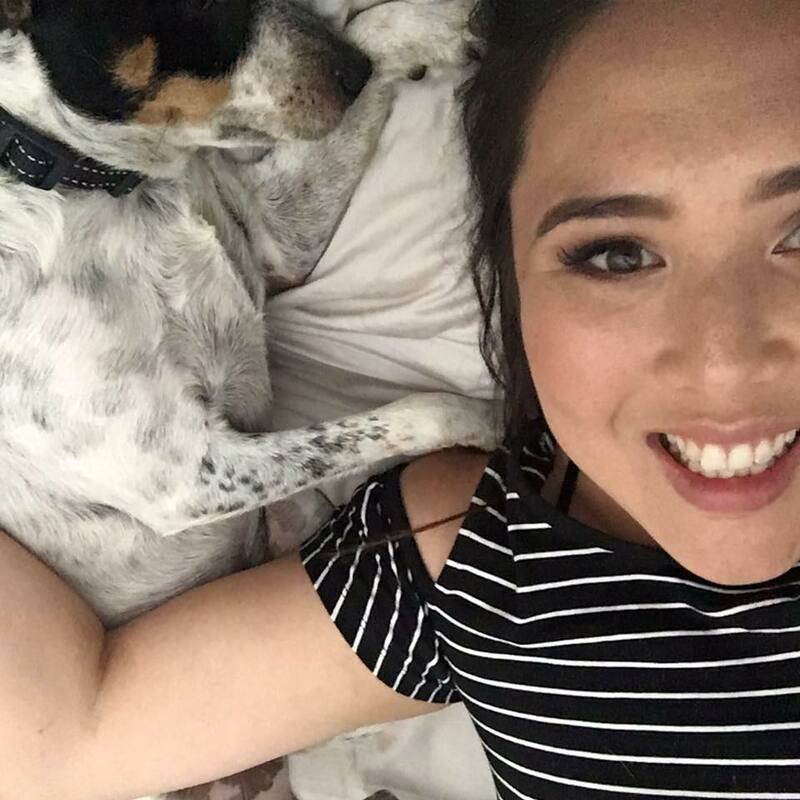 I am so, so, so in love. 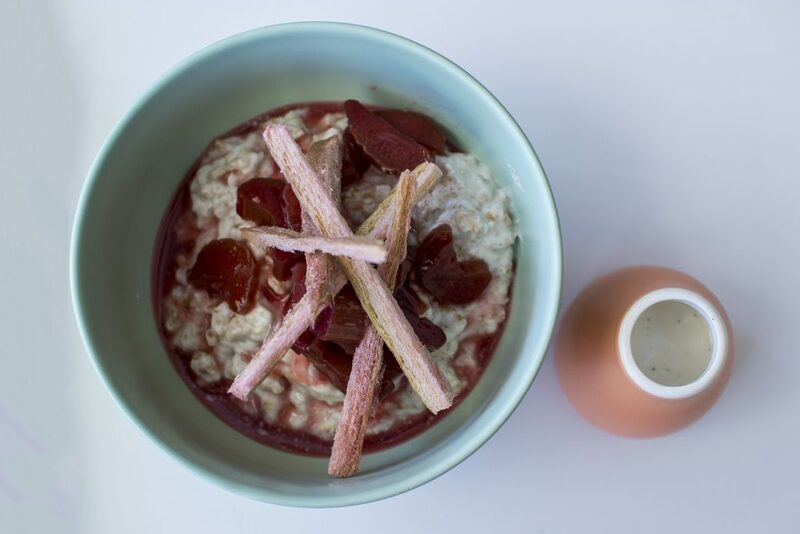 The spelt and coconut porridge with poached rhubarb ($9.00) is a really cost efficient dish that I thought packed a punch. Spelt is really quite filling, and with the rich coconut flavour it was a warm, comforting winters porridge. 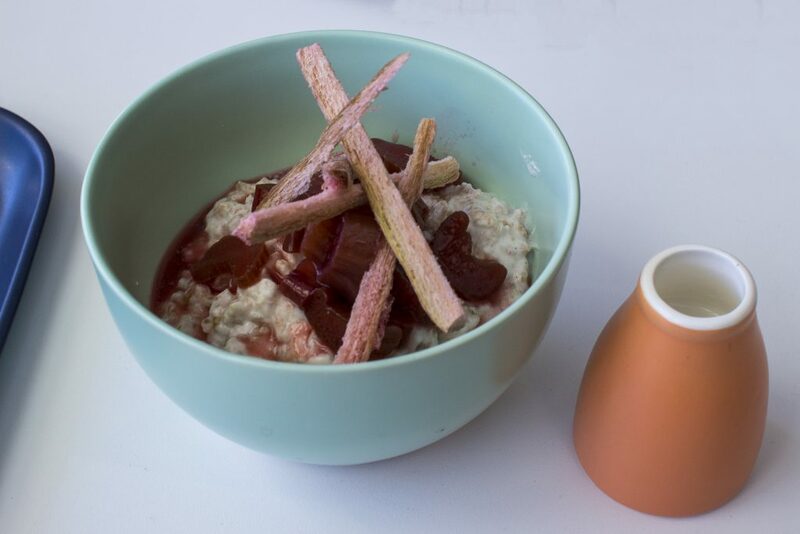 For me, the rhubarb was really what hit the mark the best for me. Soft but retaining a slight bite to each piece, offset by the dehydrated strips. I could definitely see myself ordering this again in the future. 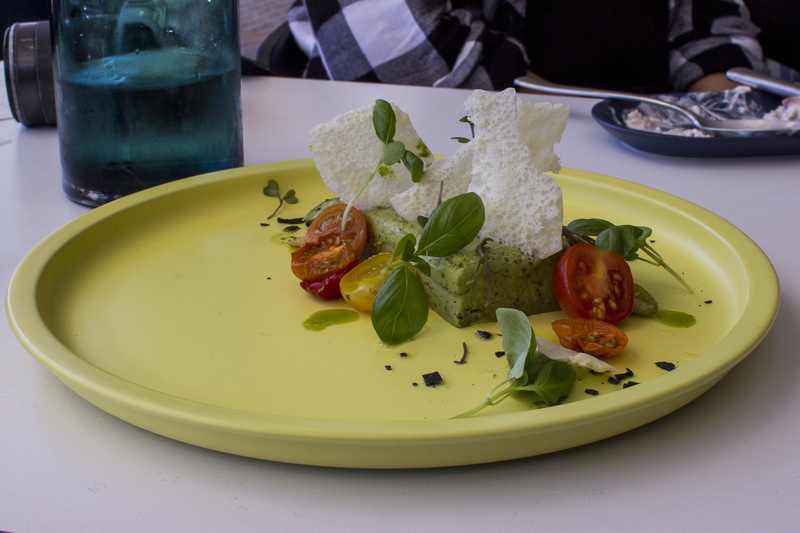 The spiced avocado mousse with salted baby cucumber, buttermilk crisp and heirloom tomatoes ($14.00) is a cheffy brunch dish if I’ve ever seen one. Gorgeous in it’s intensity of flavours and the bursts of freshness, I recommend you try this. 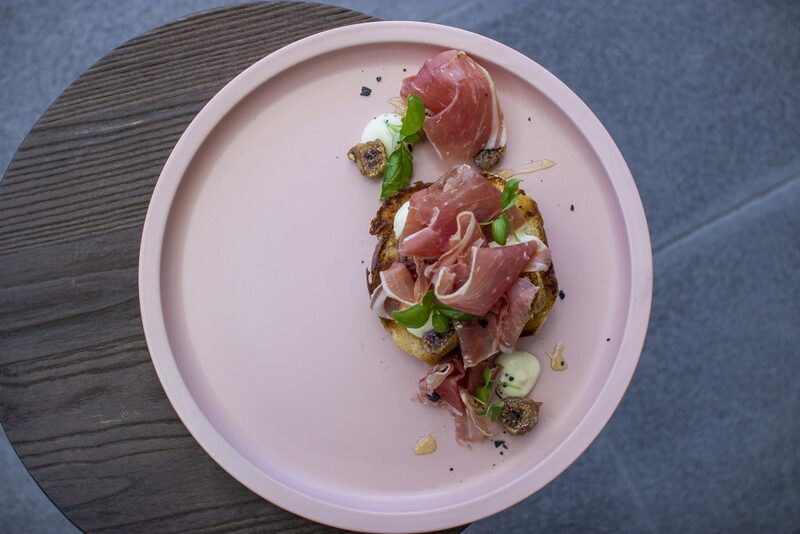 It is a small dish though, so might be a dish to enjoy sharing a few plates between friends. Trust me, it’s a textural delight. Moving on to the open toast with Israeli fig, whipped ricotta and cured ham ($14.00), there was a collective swooning around the table. 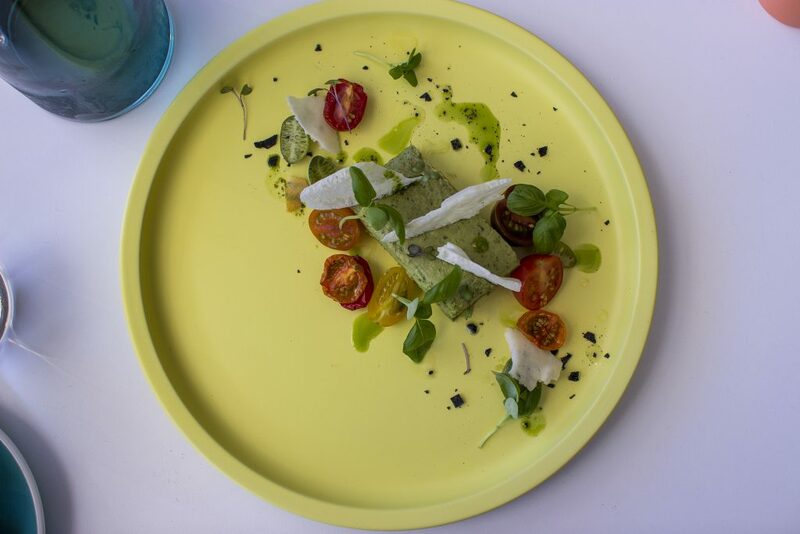 We all know these flavours are completely harmonious and it was a morish plate of food that looks visually breathtaking too. Chase told us that the ham was from the pork shoulder rather than your normal prosciutto or jamon, and I can say it definitely melted in my mouth. Meat and cheese… the Italians really did get on to a good thing early on in the game. 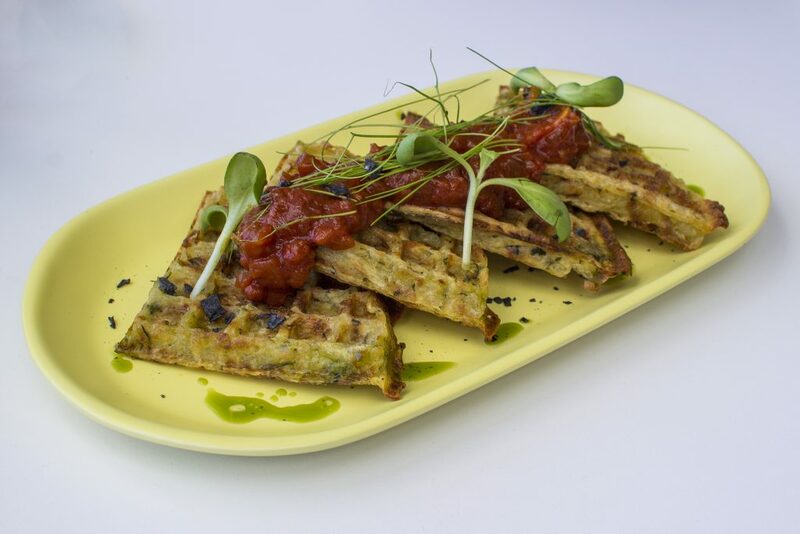 The potato and courgette waffles with tomato relish ($16.00) looked nothing like I expected when they came out to the table but what an absolute flavour bomb! They were crunchy in every bite, smacking you in the mouth from that umami-rich relish that had such a strong concentrate of taste. Since so many other brunch joints are pumping out sugar laden waffles or ones topped with fried chicken, this was a good change of pace. Again slightly on the small side – but given this is a bistro not a cafe it’s not entirely surprising. The mushroom on brioche might have been my favourite dish, but the next two were a close tied second. 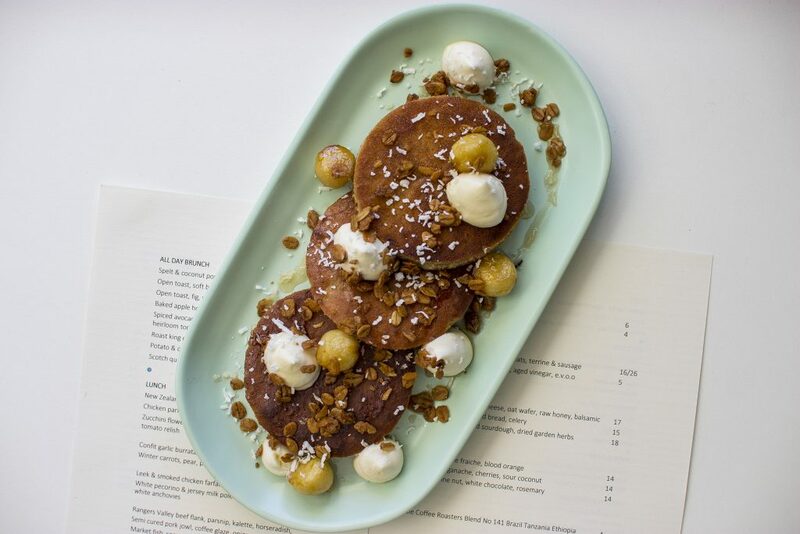 As pretty as a picture, the baked apple hotcakes with maple glazed apples and oat granola ($16.00) was light, golden brown and had just the right hint of sweetness. 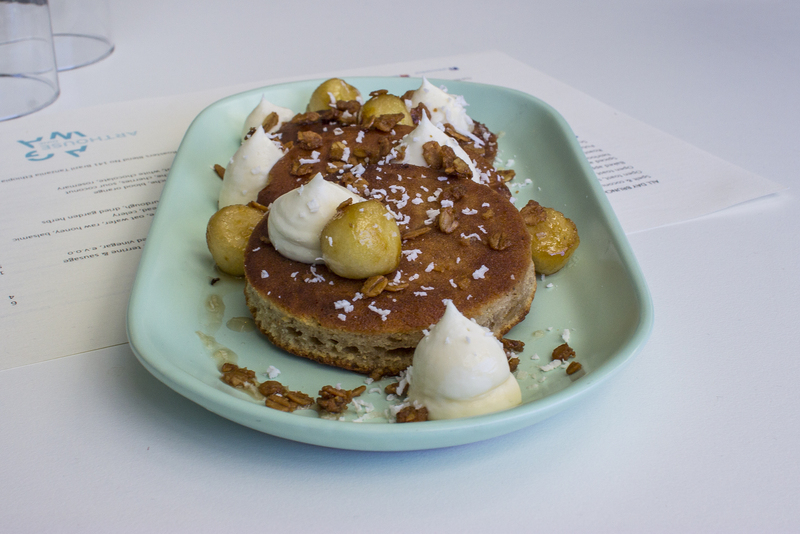 The oat granola was crunchy and satisfying, working well with the glazed round scoops of apple – it almost felt like an apple tea cake but in breakfast form. Hotcakes can often be stodgy or dense, but these were on the money. 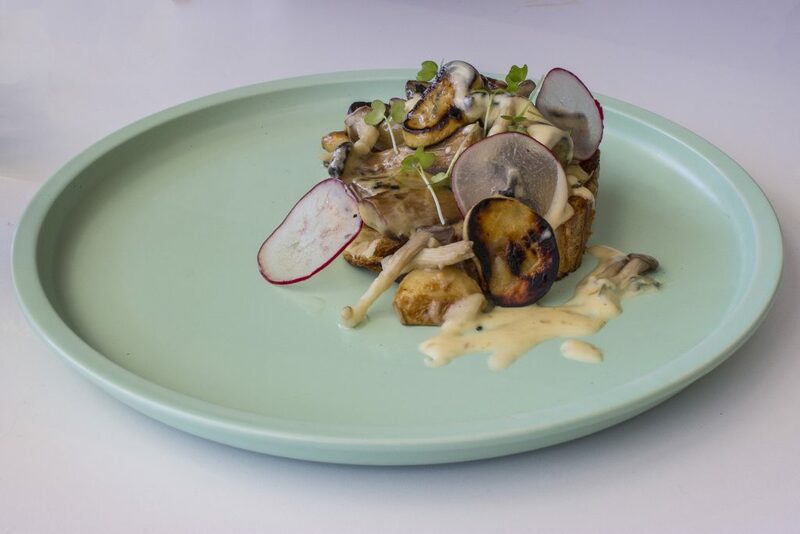 No wonder they’re the chef’s favourite dish on the menu! 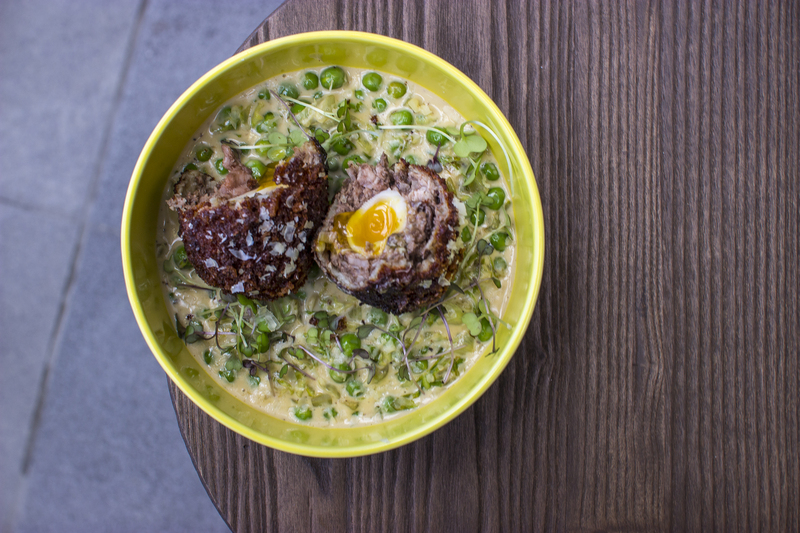 We finished our epic eating adventure with the scotch quail egg, accompanied by boudin noir, braised peas and lettuce ($18.00). Yes, oh yes. Really that’s all I want to say because that’s all I can describe it as. 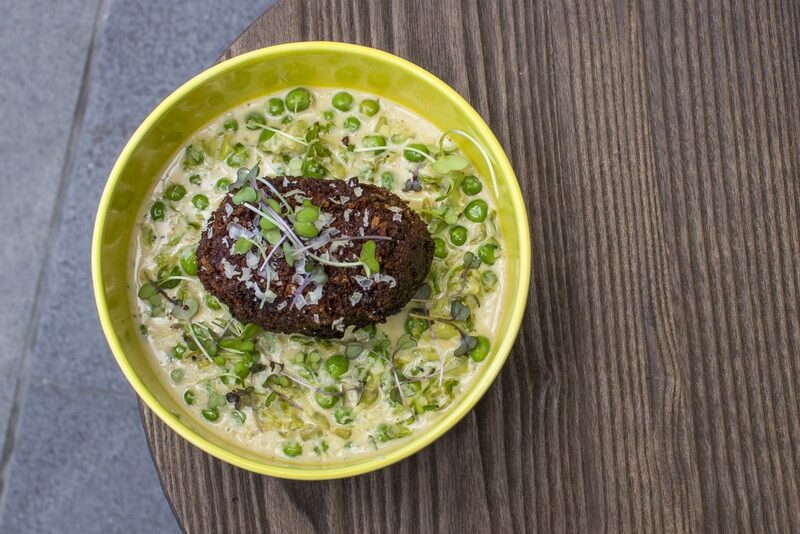 A runny, sunny yolk greeted us as we cut into the scotch egg (made with black pudding no less! 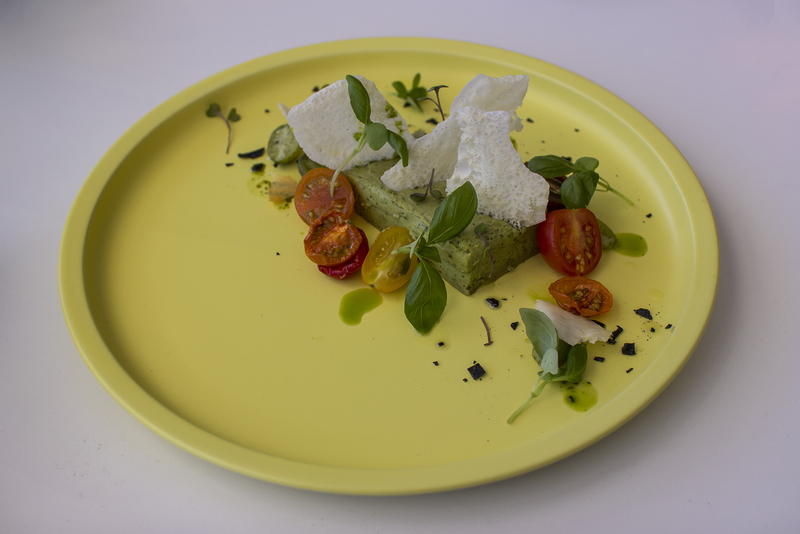 ), dripping down into the creamy mixture of greens. There was sweetness, freshness, creaminess – tick, tick, tick. An excellent rendition of a classically daggy dish and I’ll admit it was my spoon in there scraping up the last mouthfuls swimming around the bottom of the bowl. A great last mouthful to celebrate what I’m sure if my first meal of many at the newly opened Arthouse. I’ve since gone back for the opening of their dinner menu… and can say I was as (if not more) impressed by the strong offering. 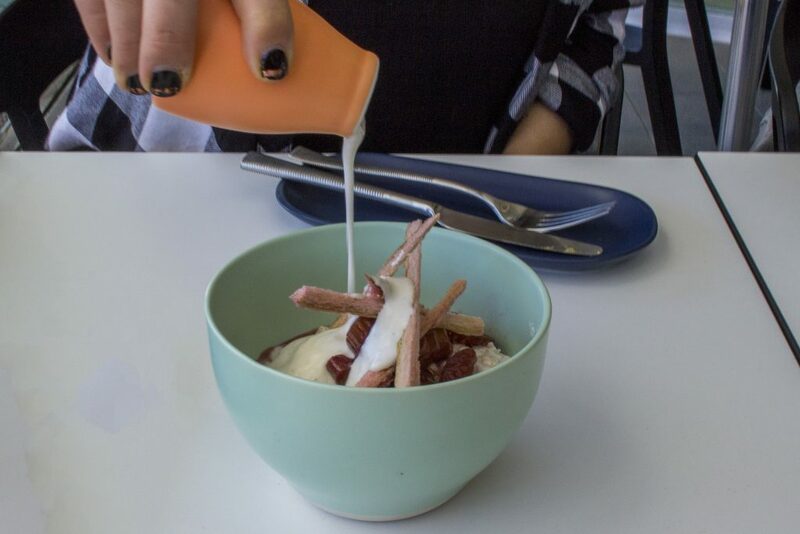 Dishes like the melt in your mouth pork jowl, jerusalem artichoke consommé, and confit garlic burrata… oh I definitely am on to a winner here!